Our lives are filled with thresholds to cross. During a university commencement, students cross a stage to receive their diploma. Then altogether the graduates move the tassel on their cap from one side to the other represent the completion of their academic studies. The crossing of the threshold of the stage represents a change that students have achieved. We enter a line at the airport. We show our boarding pass and our identification card and then cross over the threshold into the secure area of the airport. After passing through the threshold of the scanner, we are now permitted to fly to our destination. We take a new job that requires us to move to a new city. The movers have come and removed all our belongings from our house. We walk through the house one more time to make sure we have collected all our possessions. We pause in each room with our memories. We walk to the door, cross the threshold, pulling the door closed behind us. With this crossing of the threshold of change, we begin to look forward, not backward, as the opportunities of a new job in a new home in a new city begin to fill us with anticipation. To cross a threshold of change is see that our lives are lived through a constant transition of changes. They are not random but connected together. Each day is filled with these transitional moments. Each of these transitions occurs within the context of the three dimensions of the Circle of Impact. Yesterday, I had lunch with a young woman to whom I had recently been introduced. We share many values and experiences in common. In the context of our conversation, we crossed three thresholds of change. As she talked about her career ambitions, she helped me to recall milestones of awareness that I had had earlier in my life which have brought me to this moment in time. This self-awareness brought a fresh clarity about my own transition in life. Self-awareness comes from the Ideas dimension as we find clarity in understanding the values that matter to us. The sharper our understanding, the more practical and meaningful those values become. To discover that clarity is a crossing of a threshold of change that cannot be undone. To say this is what I believe and why it matters is like walking into a new room in a house and closing the door behind us. The second threshold we crossed in our conversation over lunch was relational. It has been my pattern for a long time to ask people who do you know that you think I should know and would you introduce us. The reverse pattern happens all the time as well. As we talked about her future, another friend came to mind, realizing that they would both most likely be attending the same conference over the weekend. Connections were made this morning. They have begun a relationship of mutual support and have made plans for lunch for tomorrow. We all cross thresholds of change in our relationships. We meet people and discover commonalities that bring us together into the same room for a period of time, and then we part to go our separate ways. Sometimes the parting is logical and expected. Other times, we find that our relationship, like to a spouse has crossed a threshold to where we are no longer together in the same room. We leave the room we’ve shared, closing the door behind to move on to the opportunities awaiting us. Then there is the organizational crossing of the threshold of change. This is an experience that is, in particular, a part of the life of entrepreneurs. We have an idea. We create a business plan, raise money and implement our plan. Then we find that the market that we thought existed has shifted. One of my friends, on the way to building a new business around an innovative technology that he had been working on for a decade, found himself the lead on a totally new venture. Attending an entrepreneurial boot camp, his team won the contest, found funding and now has a successful product in the marketplace. His other idea sits on the shelf waiting for a time to restart that may never come. Purpose doesn’t follow structure, but the opposite. For my friend, as she considers her next steps along her career path, we spoke about how so much of past understanding of planning was about forcing people and ideologies to fit into the institutional structures that were not well suited for them. However, this is now changing. Increasingly, I am finding people questioning whether the traditional structures which a generation ago would have been the logical place to align a person’s career path to be more of a reason to not consider a career in a particular field. Crossing the threshold of change means that everything is open for questioning. 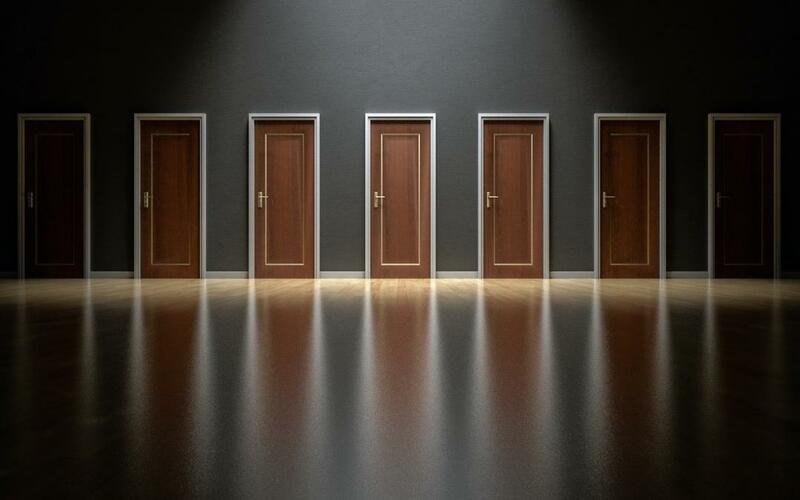 We cross the threshold into the next room, and we close the door behind us, discovering that our options are greater, more challenging, with greater potential for making a difference that matters. When we close the door behind us. We leave behind many of the things that once gave us comfort and security. We leave behind ideas that we come to realize no longer help us. We leave behind relationships with people who cannot cross the threshold of change with us. We also leave behind old ways of operating our organizations that are no longer match how the world is now functioning. To cross the threshold of change is to recognize that we are not just in a transition from our past to our future. We are at a transition point* which calls us to look closely at our lives and decide whether we are to cross the threshold into the next room, closing the door to the past behind us. * I have created a list of these threshold change moments called the 12 Transition Points. They are a part of an infographic that you can receive by signing up for my monthly Leading with Impact newsletter. Sign up at my website, http://brenegar.ghostdev.co.